Gravity Avenue A is another offering by framed. This bicycle can be used for commuting as well as riding and exercising. 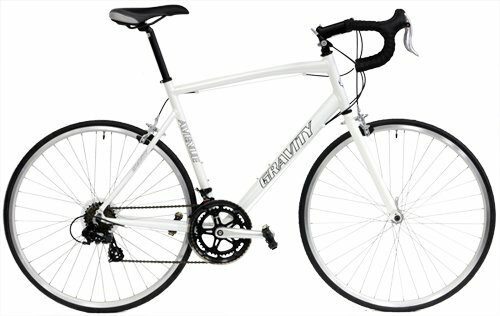 The bike comes equipped with Gravity RSeries Aluminium Frame which keeps its weight in check while making it strong. The frame uses semi-compact geometry which allows a comfortable and more upright riding position. Compact Geometry also allows easier height adjustment and you can easily customize the height of the bike according to your riding style and preference. Shimano components have been used for gearing which have a track record of performance and excellence and they allow smooth and efficient shifting. CStar Brakes provide shear braking power with control and stability. The ride quality offered by this bike is extremely smooth and can also serve as a perfect commuter. The bike has the capability of reaching fairly high speeds and if you have been looking for a bike that offers to you a complete package of speed, performance and endurance under a small budget, your search ends with this one. Gravity Aero-Profile Fork with CrMo Straight Blade and 1’’ Steerer; Shimano Double Ring Crankset (39/50T); Sealed Cartridge Bottom Bracket; Platform Pedals (9/16th Axle); Shimano FD-A050 Front Derailleur (Downpull); Shimano-A050D Rear Derailleur; Shimano SL-SY20A Shifters (14 speed); Shimano MF-TZ21 Free Wheel (14-28T-7 Speed); KMC Z-51 Chain; Gravity Silver Finished Aluminium Hubs with Quick Release Feature; Stainless Steel Spokes; Alex DA-18 Double Walled Aluminum Rims with Machined Brake Track; 700x25C Tires with Presta Valve Tubes; CStar SLR Aluminum Brakes with Silver Finish; CStar Alloy SLR Road Brake Levers; Aluminium Ally Black Handlebar (26 millimetre); Aluminium Alloy Threadless Headset; Gravity Road Saddle with Comfort Groove; Aluminium Alloy Seatpost with Micor-adjust Feature (27.2 millimetre) and Machined Aluminium Alloy Seat Clamp with Bolt. Gravity Avenue A has the capability of clocking fairly high speeds. The bike is very handy and light which can be attributed to its lightweight aluminium frameset. The ride quality offered is extremely smooth. It comes with Shimano components which offer smooth and seamless gear shifting. The CStar brakes function well and have the ability of bringing the bike to a quick halt. The bike has a slick and stylish look which is pretty impressive. The only downside of this bike is its wheels which are not good at all and you might have to get them replaced in case you are planning to ride hard. Overall, the bike delivers well on most of its promises and the price of the bike is what makes it stand out from the bunch. Looking at the set of components used to construct this bike and keeping in mind the performance it delivers, it is quite a bargain and if you are looking for a bike which can go fast, is easy to handle and offers a comfortable ride experience, you will not be disappointed with this one.